Disclosure: This post contains affiliate links. Please read our disclaimer. The dunes at White Sands National Monument aren’t formidable. They don’t cause a quick gasp of breath the way Great Sand Dunes National Park do. At around 60 feet tall, the sand dunes at White Sands are hundreds of feet shorter than the Great Sand Dunes. Walking out on the white sand brings the laid-back feeling of a beach trip whereas the sheer size of the Great Sand Dunes before you feel more like an outdoor adventure. But the lure of White Sands is its gentleness. And, obviously, its dazzling snowy color. Being out on the dunes during sunrise and sunset feels like being embraced by the sweetest love story. The quiet collection of blushed pinks sweeping into baby blues against the white gypsum sand dunes is the most tender landscape I’ve laid eyes on. Yet this landscape is fierce and harsh. Don’t let its sensitive side trick you. This is the desert after all, and the sun and wind will beat you down if you’re not careful. We carefully planned our trip to avoid high winds (20+ mph) and hot temperatures (90+°F) so we could actually enjoy our visit. While we were at the park, we also picked up a handful of tips, which we’re sharing below. There are five trails to choose from in White Sands National Monument. Three are shorter trails lined with informational signs. The other two routes, Backcountry trail and Alkali Flat trail, lead hikers through the dunes themselves. The Backcountry trail is a 2-mile lollipop that brings backpackers out to their campsites. But it’s worth hiking out for the views even if you’re not camping. Although for views of untracked dunes you’ll have to go off-trail – which the park service doesn’t advise and neither do I - unless you’re an experienced hiker. It’s extremely easy to get turned around (there aren’t any distinctive landmarks) and it’s not smart to rely on following your footprints back (the weather and wind can suddenly erase your tracks). I think the best hiking experience is found on Alkali Flat Trail. It’s a 5-mile loop that brings hikers further out into the park than any other trail. We actually didn’t get to hike the full loop because, not realizing how wonderful this trail would be, we didn’t set aside enough time before sunset. But we did hike far enough to see several skunkbush sumacs. The sumacs grow dense, deep roots creating a pedestal of sand they perch atop even after the dunes move on. This was the only area of the park we saw these plants and it’s really a neat sight. A close-up view of a skunkbush sumac. A few of them were taller than the sand dunes. Also, the further out along the Alkali Flat trail we got, the taller the dunes were and the fewer the footprints. Out there, it was the perfect vantage point of endless waves of untouched hills. We visited White Sands in the beginning of May when the temperatures peaked at 80°F. But the mid-mornings to late afternoons were already too hot for us. The sun glared down and I could feel my skin burning even when we started hiking around 5 PM. There were signs at the Backcountry and Alkali Flat Trail advising against heading out when temperatures were above 85°F. Take the sign seriously. I’d recommend hiking right when the park gates open (7 AM) or waiting until as late in the day as possible. Spring time is also the White Sands’ windy season. This doesn’t mean every day is super windy, but there will be bad days. There were advisories for winds up to 20+ mph on our first day there. I spent the morning at the park and headed back to the Toaster when the winds started picking up. I’d recommend avoiding the park under those conditions. It’s not fun getting sand blasted and it’s potentially dangerous. The upside is that footprints on the dunes could be swept away. So, if you visit the park first thing after a day of high winds, you could find yourself on untracked dunes. Bring lots of water; the park recommends 2 quarts of water per person. Don’t forget about your dog! Tyki got really hot in the short distance it took us to backpack out to our campsite. I’m guessing his dark fur didn’t help the situation. Speaking of dogs: Please pick up your dog’s poop! We ended up picking up two different sets of fossilized dog poop on our hike out. Don’t be the dog parent that ruins it for all other dog parents. While everything from the ground up gets unbearably hot, the sand remains cool to the touch. The gypsum sand was so fine that we did most of our hiking in Chaco sandals and sometimes barefoot (your calves will be sore the next day if you’re not used to a lot of barefoot walking). Apply sunblock vigorously and then moisturize yourself up at night to keep your skin happy. Remember to apply sunscreen on all your body parts that face the ground too; the white sand will reflect sunlight back up. And of course, don’t forget your feet if you hike in sandals or go barefoot. Since there aren’t actual trails on the Backcountry and Alkali loop, bright orange fiberglass posts stick up from the dunes indicating where hikers should go. The posts are placed so you can always see two while hiking to know you’re on route. The dark vertical line in right of Jerud and to his right are the fiberglass trail markers. The Alkali Flat trail is also a great place to watch the sunset. You don’t even need to hike out to get an eyeful of colors. 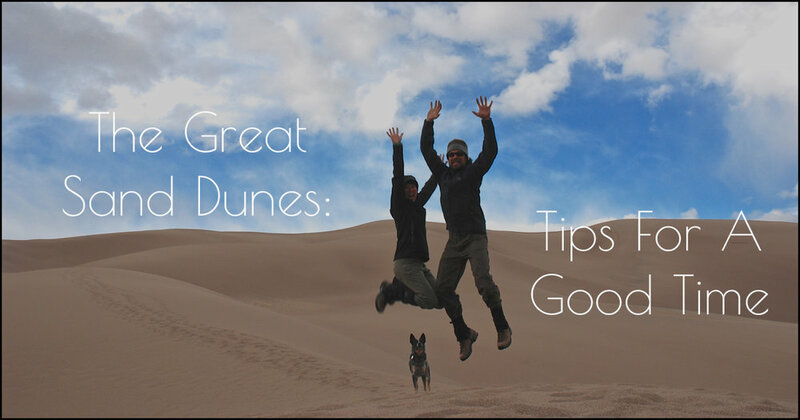 Hike up the nearest dune from the parking lot and you’ll be rewarded by a memorable sunset – as long as the clouds and sky cooperate. Just remember to be out of the park by the time the gate closes, which is thoughtfully timed after the sun sets (time varies depending on the time of year). We couldn’t pass up on the rare opportunity to spend the night out in the largest gypsum dunefield in the world. Especially because camping overnight is the only way to watch the sunrise on the dunes. We didn’t head out to our campsite until later in the day to avoid the heat. After setting up camp, we hiked further out in search for dunes with the least amount of footprints. The sun dipped lower and shadows stretched longer. We hid in the dune shadows a few times during our hike to cool off. Nightfall brought the charming fragrance of the purple sand verbena surrounding us as we headed back to camp. These flowers grow in the hardpacked sand along with soaptree yuccas, and their scent is most noticeable during more humid hours (dawn and dusk). Please keep in mind that desert vegetation such as the purple sand verbena are extremely fragile. They have to survive in some of the toughest conditions. I had set my alarm to wake me up at 1:30 AM, after the moon was sitting higher in the sky. Once outside our tent, I couldn’t pass up the opportunity to walk up to the dune above our campsite. Under the moonlight, all the dunes resembled snow-covered hills and the wind-swept ripples felt like groomed ski trails under my feet. Backcountry camping permits are only $3/person/night. But reservations and permits can’t be made in advance. You have to show up the day you want to camp out and fill out the paperwork in person (your entire group doesn’t have to be there). The permits are for one night of camping only. Head back to the visitor center and fill out new paperwork if you want to stay another night. But break down your campsite because you’re not guaranteed to get the same site. The visitor center opens at 9 AM and you must leave your campsite by 1 PM. Our boondock site was only 4 miles from the park, so I biked over first thing in the morning to get our backcountry camping permit (sans Tyki). There are only 10 campsites and the closest site is 0.58 miles away while the farthest is 0.93 miles. Yes, it’s a short hike in, but you’re still hiking in on loose sand and up hills. So, don’t be like the guy we came across at sunset who was off-trail, couldn’t find his site, and dragging shopping bags full of gear. Or the couple who had a hard time finding their site in the dark, which caused them to have a yelling match because they were also lugging their beach chairs along (we heard this second hand). Set up your camp before it gets dark. The campsites are all located below the sand dunes on hard packed sand. Camping on top of a dune isn’t allowed and tents must be setup within 5 feet of the campsite marker. Sites are positioned so they’re hidden from one another, but they are visible when walking on the top of dunes (so watch where you pee!). While the park staff told me all the campsites were identical, I’d argue that sites 3 – 8 have a better scenery. Our first choice was #5, but there was already a couple in line before me when I arrived the visitor center at 8:46 AM. So I randomly chose #8. Our tent at campsite #8, set up 5 feet from the sign. Mid-day is brutal out in the dune fields. We hiked out around 3 PM, but should’ve waited another 1 – 1.5 hours. The only shade is what you create, until the sun gets low enough for the dunes to have their own shadows. Leave No Trace applies everywhere in White Sands, which means if you need to poop it’s either digging a 10-foot deep hole (yes, I’m serious), pooping into a bag (sold at the visitor center), or holding it until you’re back in the parking lot where there are toilets. I pooped in a bag, sort of. Ask me in person and I’ll tell you the story. Pee anywhere you want, but we were told to cover it up with sand. It cools off a lot after dark. Bring extra layers, especially if you plan to get up in the middle of the night or before the sun rises to take photos. The parking lots inside the park are huge! They will easily fit your rig if you decide to drive it in (unless it’s during their busy season – whenever that is). One thing you could do is arrive with your rig right when the park opens, park, hike during the cooler hours, hang out in your rig during the hot hours, and then go back out for sunset. That way you can spend the whole day in the park with the least amount of driving. But overnight camping in your rig or car is not allowed, and park rangers do patrol the parking lots. I hope you have a wonderful time at White Sands National Monument. We really enjoyed ours and plan to come back to camp out again! We visited May 2 - May 4, 2018. Or Show Your Support Through Ching’s Shop, Viridian Range.